I should start by saying that I think very highly of Father Snoop - higher than the dogg himself before he "gave up" smoking. 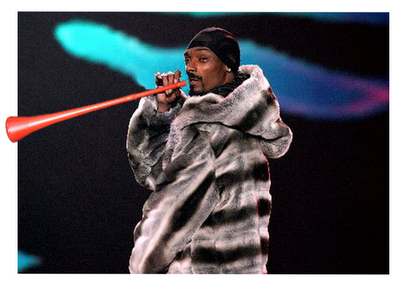 Beyond his resume, I admire how true he is to his image: with every molecule of his being he is definitely Snoop Dogg. He could never be anything else than Snoop, which is probably why he has never gotten serious about acting. But Snoop Dogg's rhymes have been for a long time softening ("Bikinis, tankinis, martinis, no weenies", I'm just glad he didn't include zucchinis like we thought he was going to) and now often rest on true but obvious pop culture references: e.j. "I be like True Blood, I sink me teeth in". I mean, it makes sense, but not in any special way, and True Blood is kinda soft as a reference - as soft a reference as putting your dad down as a reference for that finance job you were trying for. So to me, it seems inevitable that Snoop Dogg is soon going to say something about a vuvuzela, the horns that blew straight through the World Cup. Right? "makin noise like a vuvuzela" or "she knows that i've always been a playa/got her blowin me like i'm a vuvuzela"
It's one of those statistical certainties. It hasn't happened yet, but it almost certainly will. I'll let you know when it happens.